Periodontics Specialist - Latin American University (Mexico). 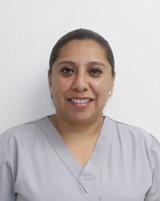 Diplomate in Implant Dentistry - UNAM (Mexico). First International Congress of the Dental Academy - Orthodontics Dental Association of Mexico (Mexico). International Implant Dentistry Congress UNAM (Mexico). Implant Therapy - The Academy of Osseointegration (Illinois). Periodontal Plastic Surgery Course - UDEM (Mexico).